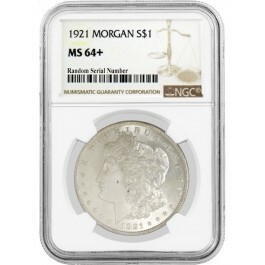 A 1921 Philadelphia (P) Morgan Silver Dollar graded Mint State 64 Plus (MS-64+) by NGC. This piece displays an original vibrant white/off white creamy luster, light lilac/golden toning and excellent, sharp details. A couple dark spots visible on Liberty's cheek/hair area. The total mintage for this date & mint mark: 44,690,000. Please view our photos for additional information and ask any questions prior to purchase.